DENVER -- Chris Iannetta flung the bat aside as if he got all of the pitch. In a way, he did -- a walk's just as good as a hit, particularly with the bases loaded in the ninth. Iannetta brought in the winning run by drawing a five-pitch walk, and the Colorado Rockies beat the Los Angeles Dodgers 4-3 after squandering a late lead Sunday. "I like my chances against a guy in that situation -- someone with their back against the wall and has to make pitches over the plate," the Rockies catcher said. It was the second walk-off win in as many days for Colorado. Ryan McMahon lined a three-run homer in the ninth inning Saturday. DJ LeMahieu led off Sunday's ninth with a single to right that Yasiel Puig misplayed, allowing LeMahieu to take second. After David Dahl was intentionally walked with one out, Ian Desmond grounded out. McMahon was also walked to load the bases. Manager Bud Black thought about using pinch hitter Carlos Gonzalezbut elected to stick with Iannetta, who drew the walk off Dylan Floro (4-3) when the right-hander's sinker missed low. "I don't get the job done and we go to the next inning. It's not live or die," Iannetta said of the pressure situation. "If he doesn't get the job done, the game's over." The Rockies took three of four for their first home series win against the Dodgers since April 7-9, 2017. The loss dropped the Dodgers out of a first-place tie with Arizona in the National League West. It was the third consecutive game a Dodgers bullpen without Kenley Jansen -- who's sidelined with an irregular heartbeat -- was tagged with the loss. "When you're putting guys in a tough spot in tight situations where every game is close and you can't get any breathing room, it makes it tough on everyone," manager Dave Roberts said. Davis got two quick outs in the ninth before walking Dozier, who stole second and then third when the shifted infield wasn't paying attention. Davis retired pinch hitter Joc Pederson on a grounder to end the inning. 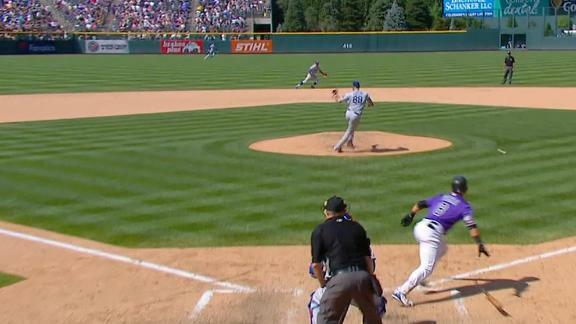 "They bended a little, didn't totally break," Rockies manager Bud Black said. Bettis went 6 1/3 innings, allowing one run and three singles. It was his second start since returning from the disabled list after a pesky blister on his right middle finger kept him out for a month. Dodgers left-handerRich Hill threw six innings and allowed three runs, two earned, as he returned to the mound at Coors Field for the first time since April 23, 2008, when he was with the Chicago Cubs. Dodgers: LHP Julio Urias will soon pitch three innings at Double-A Tulsa as he takes another step in his rehab from June 2017 shoulder surgery. Urias turned 22 on Sunday. Rockies All-Star 3B Nolan Arenado was close to playing Sunday, but the team decided to give him another day to rest his sore shoulder. The team has an off day Monday before playing in Houston, where Arenado could play third or be the designated hitter. "Feels better for sure," Arenado said. It was a frustrating day for Manny Machado, who went 0-for-4. He broke his bat over his leg after striking out in the seventh. He was lifted in a double switch in the bottom of the inning. Dodgers: LHP Clayton Kershaw (5-5, 2.58 ERA) will go against another ace in San Francisco LHP Madison Bumgarner (4-4, 2.69) to open a three-game series Monday. Kershaw is 22-10 with a 1.60 ERA in 42 starts versus the Giants. Rockies: Monday provides the first day off after 17 consecutive games. The Rockies will open a two-game series at Houston on Tuesday, with RHP German Marquez (9-9, 4.69) taking the mound. The Astros will throw RHP Justin Verlander (11-7, 2.50). John Axford gets hit by a fast ground ball that bounces directly to Max Muncy, who tags out Gerardo Parra on his way to first base.